GeekRex | Do We Really Want A 'Genetic Sibling' of Aliens? Do We Really Want A 'Genetic Sibling' of Aliens? Recently, Neill Blomkamp released some interesting concept art on Instagram about his ideas for an Alien film, and the Internet got really excited. After the lackluster Prometheus, people were starved for a real Alien movie, and Blomkamp's images gave them a focal point. 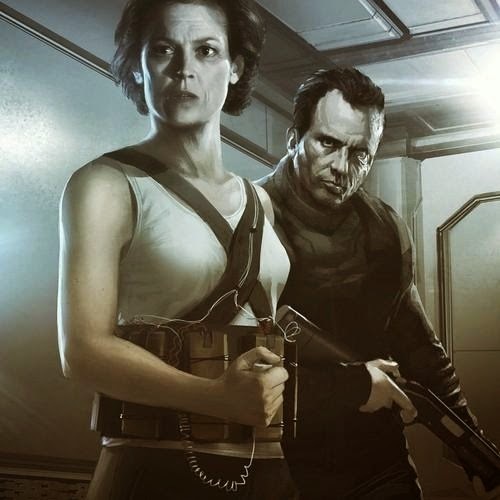 So now, Blomkamp's movie is happening, but that concept art - featuring long-dead character Hicks - suggested something now confirmed: Blomkamp wants to make a 'genetic sibling' to Aliens, ignoring the more controversial Alien3 and Alien Resurrection. This is a monumentally dumb idea on a few different levels. After all, the Alien films have never been 'genetic siblings' of one another. Instead, Alien provided the template - a vicious triangle of humanity, corporate abuse, and the Xenomorph - that each film would explore in radically different ways. Where Alien was the perfect horror film, patient and menacing, Aliens was a bombastic sci-fi action story without a lick of fear to be found. Instead of a small band of humans fighting one Xenomorph on their home turf, it was hundreds of Xenomorphs on their own turf fighting a small band of humans. They were different genres, with different locales, different types of casts, different endings. Alien3 was minimalist and nihilistic, a dour counterpoint to the more hopeful Alien and Aliens that showed the limits of how much one person could do to prevent chaos. In Alien3, heroes don't get to live to tell their tale. Finally, Alien Resurrection saw Joss Whedon bring a healthy dose of meta-commentary to the franchise while laying some thematic groundwork for Firefly. Indeed, Alien Resurrection mocks the very idea of Blomkamp's project, commenting explicitly on the ineffectual horror of trying to recreate and mass produce the alchemy of those first films. Each film works, not only as a sequel, but as its own film. Each film is surprising, and each is the recognizable product of a strong, unique creative vision. At best, the series made cursory nods to traditional franchise filmmaking, specifically with Ripley. But, as much as I love Sigourney Weaver in her most iconic role, her story - from a gender neutral blue collar worker to surrogate mommy to genetic super-clone - is the weakest part of a very strong series of films, and Alien3 is a great conclusion for her. Eventually, the loopholes needed to explain how Ripley just kept getting into the same fight ate the franchise alive; making it more complicated certainly isn't going to solve that problem. From everything he's put forth, Blomkamp's film is typical Hollywood franchise-building: What you already had, but more! It's the worst kind of sequel, the kind that's basically just bad fan fiction. It's also the kind of sequel Hollywood loves, easy to market, easy to churn out. Tellingly, despite how much money the Alien movies made over their lifetimes, it has taken over half a decade to make a sequel to each one. Why not get a fan of the previous one to... just do that again? Blomkamp seems like a fairly talented director, and he may very well make an enjoyable Alien film. I sincerely hope he does, because I want to see the promise I saw in District 9 again. Perhaps his comments - "I want this film to feel like it is literally the genetic sibling of Aliens, so it's Alien, Aliens and then this film." - have been misconstrued, though that's... fairly blunt. Any of a thousand things could change between now and the not-yet-decided release date for a film that doesn't even have a script yet. But if all he wants is just more Aliens, he'll be helping tear down one of the greatest film franchises in Hollywood history. I may not like every film in the series - Aliens and Alien Resurrection leave me pretty cold - but I love that each time I saw a new one, I knew I was in for a surprise. We have a hundred young directors who can do a subpar James Cameron impression, but we don't need another Terminator 3: Rise of the Machines. We don't need a fan. We need a filmmaker who is willing to burn it all down to give us a great goddamn movie.